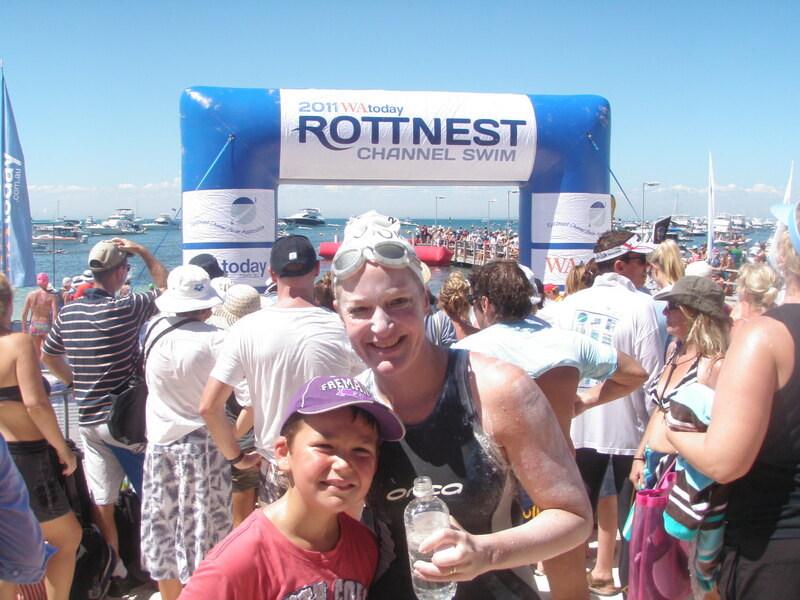 My first Rottnest Channel Swim was in February 2009. I travelled out from Ireland to Perth, with my first marathon swim looming. I was excited, nervous, and very, very ‘green’. John Conroy arrived about a week later, and we went over our tactical plans. I think John was even more nervous than me. Coach Eilís Burns had trained us well, explaining that she had trained us more than we needed so we could come down to meet the requirements rather than work up. For two days before the swim, we stayed in Cottesloe, which was a great decision. You can see Rottnest quite clearly, along with all the huge ships in the channel. There was a great buzz with the locals, and it was full of swimmers and their families from all over Australia, and the rest of the world. I looked enviously at some swimmers walking around with previous year’s swim shirts on, and looked forward to getting mine! The briefing for the international and interstate competitors was held the morning prior to the swim, which was very informative and well presented. There was a light-hearted atmosphere, mixed with a measured dose of apprehension. My husband Mick, John and I spent the rest of the day eating and relaxing (and in John’s case fitting in an emergency Chiropractor session) and then bed. Not much sleep was had. I was nervous, excited and paranoid that I would sleep out my alarm clock. I must have driven Mick demented but he remained his usual calming self. At 4am and we were up, eating, applying sun cream, eating some more, and drinking loads of water. We then set off to registration which was only a short stroll, with our kayak. As soon as we got there, the buzz was fantastic. It was still dark, thousands of people milling about (150+ solo swimmers, 2000+ relay swimmers, crews, families, etc.) , and hundreds of boat lights lit up the water. The time passed very quickly, more eating, drinking and applying sun cream and lanolin. Mick then left me to go out to the kayakers point. Suddenly it was just me and the water. 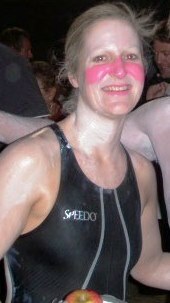 The premier of Western Australia started the swim. I was in the first wave which included the fastest men and all of the women. Off we went. The water was beautifully warm, around 24 degrees. I swam 400m to the pickup point for the kayakers. Mick had spotted me right from the start and had kayaked outside the swim zone, following me to the pickup point, so there was no issue here. We then continued on to meet our support boat. We had a small hiccup at this point, and couldn’t find our boat at all (there are boats everywhere at the start and it can be quite confusing). I was worried that I would be disqualified after months of training, but the official boats found us and were brilliant in joining us with our boat. At this point I felt that the swim had begun. The sun was coming up and the water was so clear. Just beautiful. I didn’t see much sea life (apart from stingers). I thought I would see lots of fish, but I guess they were scared off by all the boats. There was a very specific plan in place for fish of the larger variety, and at no time did I feel unsafe. 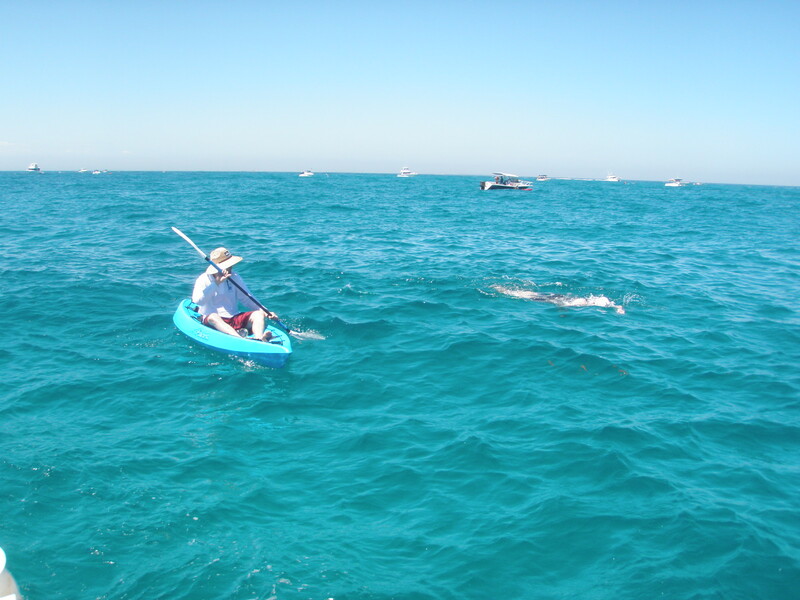 As my mother said afterwards, ‘no self respecting shark is going to go near 800 boats’…. 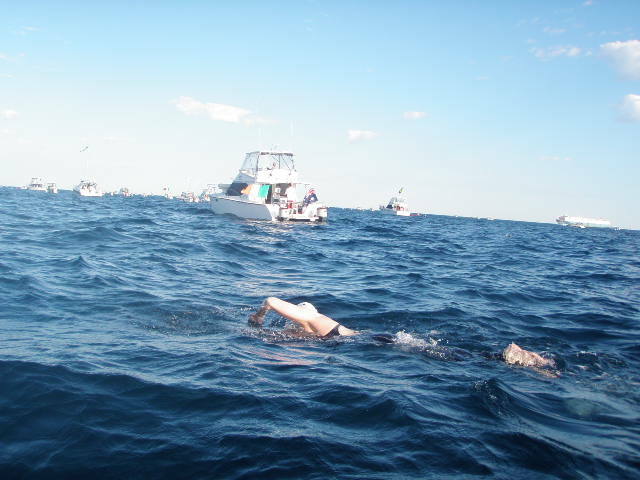 What I loved about the swim was from the moment I left Cottesloe beach until I landed at Rottnest, I could see the bottom the whole way, every ripple in the sand. In later years’ swims I discovered that this was not the norm, so I was very lucky to have experienced it. Another great part was the cheers and encouragement that I got every time I was passed out by relay teams. All day long there was fantastic camaraderie. My step-Dad was my skipper and along with Mick who kept all the crew (and me) together, my brother kayaked. My Mum and our kids, and my sister, brother in law and sister in law and all the cousins met us on the island so it was very much a family affair, and very special. The air temperature on the day was about 36 degrees, and the sun was scorching. One of the things that I have changed in later swims, is to apply sun cream the night before, as soon as I get up, and before I get in the water, as the first year I was badly burned, the only down side of the day, but still, a learning curve. The other learning curve was the rule of halves. The first 10k flew by in 3 and a bit hours. The second half was long and near the end I swam into a hard current and wind FOREVER! My finish time was just over 9 hours and in later years I was better prepared for the last push. When we landed we had time for a quick shower, and then straight back to the beach for the awards. I was feeling very weak at this point and was not handling being upright very well, but managed to get in for the traditional solo finishers photo, and get my finishers trophy. My expectations of a crazy night at the Rotto pub unravelled as I made my way back to the boat we were staying on and went to sleep. We stayed on the island for a week afterwards which was brilliant, and we had plenty of time to celebrate. This part hasn’t changed for us and we are looking forward to the same this February. The Rottnest Channel Swim is an iconic Australian swim that attracts swimmers from everywhere. And why not? You leave from one of the most beautiful beaches in the world to arrive at one of the most beautiful islands. I have since swum the swim 3 more times, and my tactics have changed considerably. This has resulted in me having no problem staying upright after the swim, and getting there a lot quicker. Last year Mick and I even managed to go to the bar with Ned Denison…..well, we couldn’t let him go on his own now could we?